Congratulations to our FMS 2016-17 Teacher of the Year is Mr. Matthew Penna. 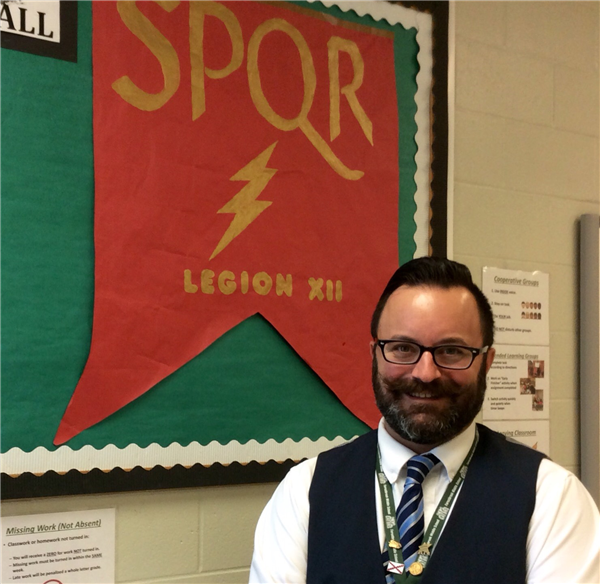 Mr. Penna, who teaches 7th grade social studies, won the 2016-17 award for the South Caroilna Council for the Social Studies (SCCSS) Outstanding Lesson or Unit: Best Practices in Social Studies. The SCCSS annually honors the outstanding performance of teachers, college professors, and other worthy individuals and programs that work to promote quality social studies in the Palmetto State. We are so proud of you, Mr. Penna! Mr. Penna traveled on October 8, 2016, to Columbia and attended the awards breakfast. Congratulations, Mr. Penna, on your selection and your contributions to the advancement of social studies in South Carolina! Mr. Penna, you make us GATOR PROUD!